The press is currently in my studio on Bergen Street in Brooklyn, NY. A bit below ground floor, but no stairs, and there is a freight elevator. It is mounted on a pallet so it can be easily moved with a forklift. I have movers I’d recommend! 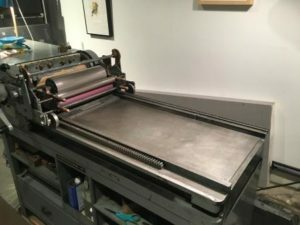 – It’s in great shape and I’ve used it for tons of wedding invitation and greeting card work over the last several years. – Related materials are included: all the wash-up parts that are not currently attached, lockup bar, quoins and keys, 9” x 12” standard relief Boxcar base, and more. – The press is mounted on a pallet, so it’s a breeze to move with a forklift.